QB Blake Bortles vs. S Adrian Colbert – One reason for Bortles’ success the past three weeks would be his accuracy, as his adjusted completion percentage of 81.0 percent ranks sixth in that span. He has also thrived when given time in the pocket, as his passer rating of 137.5 when throwing after 2.6 seconds or more is tops in the league over the last three weeks. Injuries have forced Colbert into a big role as a rookie and he has responded well with an overall grade of 78.8. Despite the inexperience, Colbert has been targeted just once every 33.3 coverage snaps and his 0.34 yards allowed per coverage snap is 16th at the position. Bortles has had success targeting free safeties in recent weeks, so it’s likely he’ll look for a few matchups against the rookie on Sunday. 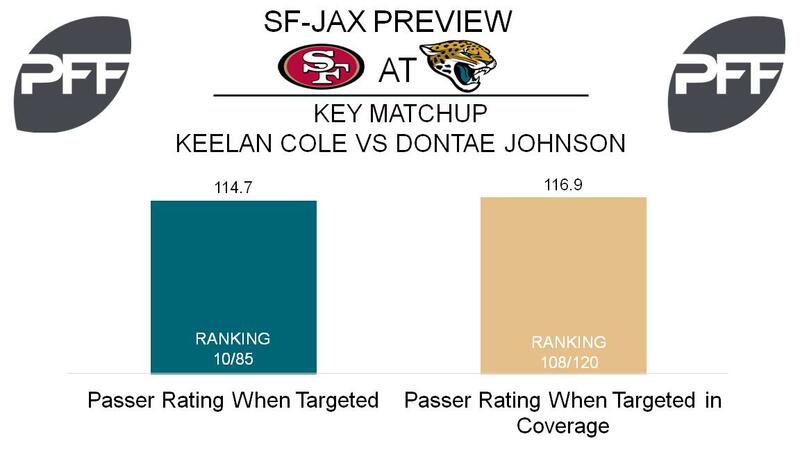 WR Keelan Cole vs. CB Dontae Johnson – While Cole had a ridiculous Week 15 performance, the undrafted rookie is much more than just a one-week wonder. For the season, Cole’s passer rating when targeted of 114.7 ranks tenth among wideouts. From Week 10 on, Cole on a per route basis has been extremely efficient, as his 2.34 yards per route run are 15th among receivers in that span. In Marqise Lee’s absence, Cole figures to continue running most of his routes from the left side and figures to see a lot of Johnson, who has allowed a passer rating of 116.9 when targeted in coverage. Checking in at 106th among corners by allowing 1.52 yards per coverage snap, expect Johnson to be tested early and often against the emerging Cole. T Cam Robinson vs. Edge Solomon Thomas – After showing improvement the past few weeks, Robinson’s Week 15 grade ranked 64th among tackles. Despite the recent struggles, his pass-blocking efficiency of 94.7 is 35th among tackles in the past four weeks. Fellow rookie Solomon Thomas has also taken his lumps adjusting to the NFL, as his overall grade of 49.9 is 101st among edge rushers. The past five weeks, Thomas has had more success as a pass-rusher, with a pass-rushing productivity of 8.9 compared to his cumulative total of 6.9. In the same five week span, Thomas has made strides against the run, with a run-stop percentage of 12.1 that is seventh among edge defenders. Robinson enters this contest with a run-blocking grade of 35.3 that’s 77th among qualifying tackles. QB Jimmy Garoppolo under pressure — After staying mostly clean in the pocket during his first start in Week 13, Garoppolo has been under duress often in the past two games, seeing pressure on 42.7 percent of his dropbacks (the sixth-highest rate). The good news for 49ers fans is that, outside of a couple questionable throws, Garoppolo has been excellent under pressure through his first three starts in San Francisco. Garoppolo has put 76.3 percent of his pressured pass attempts in a catchable location, which would be the highest rate in the league by a significant margin if he had enough attempts to qualify, and no quarterback has had a higher percentage of positively-graded throws under pressure this season (44.7 percent). 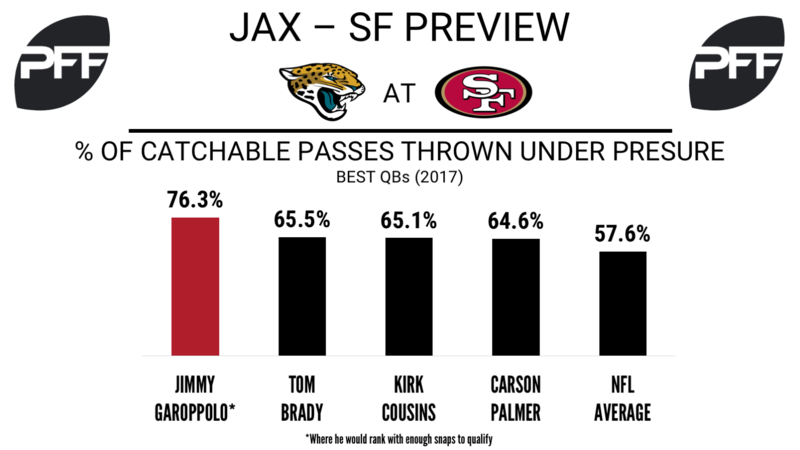 There’s little reason to expect Garoppolo to have a more pleasant experience in the pocket this week against a Jaguars defense that has pressured opposing passers on 39.1 percent of dropbacks, the fifth-highest rate. T Zane Beadles vs. Jaguars edge defenders — With Joe Staley and Trent Brown manning the tackle spots for most of the season, San Francisco’s primary concern in pass protection has been on the interior. However, with Trent Brown recently sidelined for the rest of the season, those concerns have moved outward as well. Through two games in relief of Brown so far, Beadles has allowed 11 total pressures — only Philadelphia’s Halapoulivaati Vaitai has allowed more (14) over the past two weeks among tackles. The Jaguars move players all around their defensive front, so Beadles will see several different defenders lined up across from him throughout the game. Jacksonville edge defenders have recorded 179 total pressures this season, the most any team. WR Trent Taylor vs. CB Aaron Colvin — With Jalen Ramsey and A.J. Bouye — two of the top-five graded cornerbacks on the season — patrolling the outside, the 49ers will almost certainly have to look elsewhere for significant production in the passing game. Colvin has been solid this season, earning a 79.6 coverage grade (43rd) while allowing just 0.79 yards per cover snap from the slot. Since Garoppolo took over as the starting quarterback, Trent Taylor has seen both his volume and efficiency increase out of the slot. Through his first 11 games, Taylor was targeted once every 6.8 routes run and averaged 0.90 yards per route run (46th of 59) from the slot. With Garoppolo at quarterback, he’s seeing a pass come his direction once every 5.5 routes run while averaging 1.95 yards per route run.